It’s bad enough when you are seriously injured in a crash of any kind. But when the driver leaves the scene, that is the definition of adding insult to injury. That is why law enforcement is working on programs to help reduce or solve the problem. In Florida, 25% of all crashes in 2016 were hit-and-run accidents. To be more exact, the Florida Department of Highway Safety and Motor Vehicles listed 99,004 hit-and-run accidents in the state. Amazingly, a significant number of drivers would not face charges or even receive a ticket if they stayed at the scene after a crash. But by leaving the scene of an accident, even where that driver was not at fault, makes that fleeing driver subject to arrest and imprisonment. As an example, Florida law provides that leaving the scene of an accident when someone has died is a first-degree felony punishable by a $10,000 fine and up to 30 years in prison. Even with this penalty, the numbers of hit and run accidents continue to rise. In 2016, there were 20 fatalities and 141 injuries as the result of hit-and-run crashes. There were more than 19,000 hit-and-run cases in Miami-Dade in that same year. So why do drivers leave the scene? Incredibly, some drivers aren’t even aware that they hit someone. In too many cases, an elderly driver is found to have left the scene and later found to have absolutely no idea that they were involved in any type of crash. 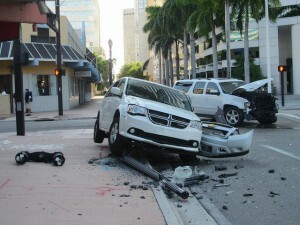 Call a Miami hit and run car accident attorney to help you get the answers you need. The number of hit and run accidents in Broward also rose in 2016. There more than 11,500 hit-and-run accidents in Broward last year. Of those crashes, 119 people were injured and 14 people died. These are the best estimates available because the State of Florida does not have a uniform database on a statewide basis on hit and run crashes. Our Broward hit and run accident attorneys have handled many cases that started out as a hit and run but thankfully, the responsible party was held accountable. In some cases, a witness provided a tag number or vehicle description. In other cases, the driver’s conscience got the better of them and they returned to the scene. In other cases, a Good Samaritan followed the hit and run driver until law enforcement could apprehend the driver. The folks in West Palm Beach were not immune from this epidemic of hit-and-run crashes. In 2016, officials counted 102 injuries and 12 fatalities in Pam Beach County. In total, there were more than 7600 hit and run accidents in Palm Beach in 2016. Of all the hit-and-run accidents in Florida in 2016, only approximately 16& resulted in charges. In real numbers, in 2016 there were 99,004 hit-and-run accidents resulting in only 15,851 charges. Hit-and-run accident statistics reflect more than vehicles colliding. The victim of a hit and run driver could be a pedestrian, bicyclist, moped operator, skateboarded, roller skater, motorcyclists or anyone unfortunate enough to be struck by a vehicle that leaves the scene. Our West Palm beach hit and run accident lawyers have helped victims of West Palm Beach hit and run crashes for more than 50 years. We investigate the crash and accident scene. We cooperate and coordinate our efforts with law enforcement. Our WPB car accident attorneys also know how to identify any potential insurance that may help you in your time of need. At the Wolfson Law Firm, our accident lawyers and injury attorneys pride themselves in providing each client with a professional yet aggressive legal representation in a relentless pursuit of justice and compensation. We have offices in West Palm Beach, Fort Lauderdale and Miami and we welcome you to make an appointment with us for your free consultation. If you need us to come to you, we are glad to do so. If you or a loved one was seriously injured in a hit-and-run crash, don’t be a silent victim. Get the answers and the help that you need and deserve. Call the Miami personal injury attorneys at the Wolfson Law Firm today for your free and confidential consultation at 305-285-1115 or toll-free 855-982–2067.